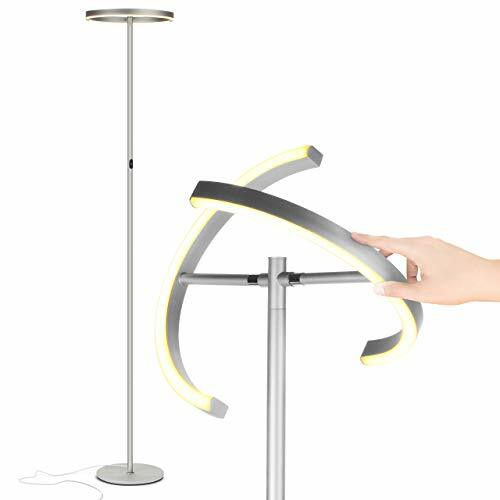 Brightech's Halo Split LED Torchiere FloorLamp is the impressive way to light your home in stunning new ways. It'sboth versatile and efficient and it definitely won't break the bank. It shinesat 30 watts but uses far less power than the equivalent incandescent orhalogen lamps. It also doesn't produce heat, so you can leave thelight on for hours without worrying about the bulbs overheating or makingyour space uncomfortable. 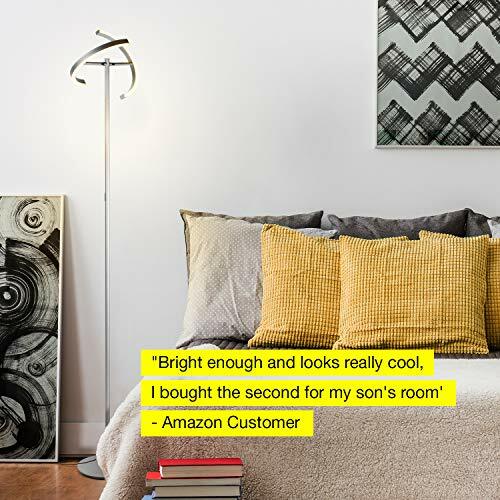 You can adjust the lamp's brightness level with asimple touch of a button featuring three dimmer settings and effortlesslycreate the right amount of light at any given hour of the day. The dimmestsetting can even be used as a night light! 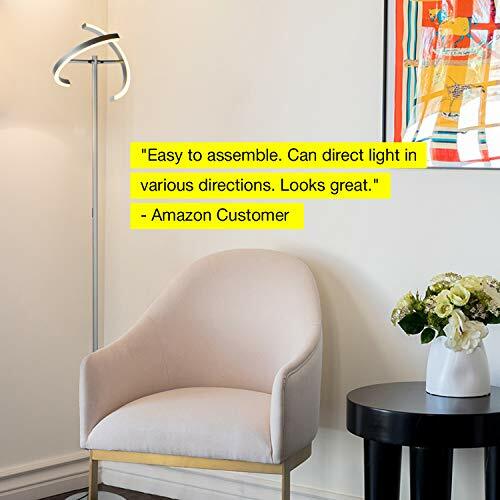 You can also angle each sideof the lamp's head to set the scene just how you need it, with the LED facingthe walls and out of your face, or you can use it as a downlight to have morefocused light over areas that need it. 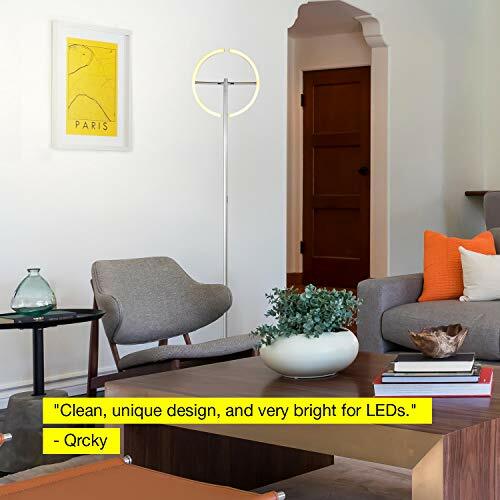 The simplicity of the lamp's design allows you to have it upright andglowing within minutes. 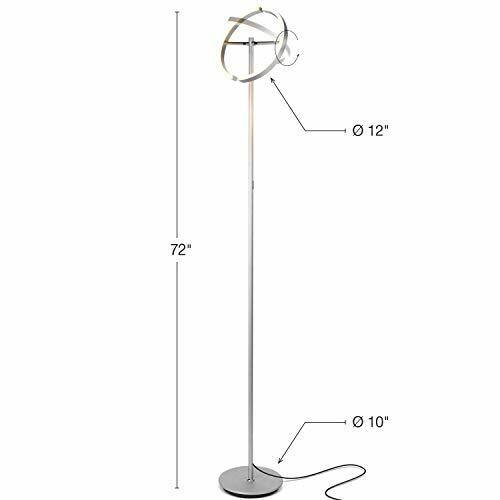 Your energy saving floor lamp will arrive packaged with the lightfixture, pole sections, floor lamp base, and plug-in adapter wrappedseparately. 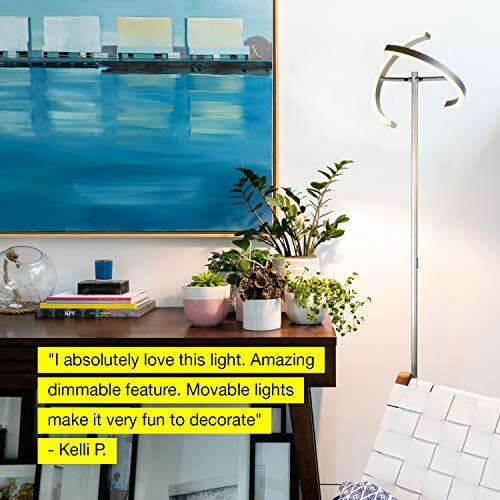 The slenderness of the lamp allows you to position it in thetightest corners or spaces. Lamp cord extends over 6 feet. In addition, the LEDlight has a life expectancy of 15- 20 years, so you'll never need to replaceit! 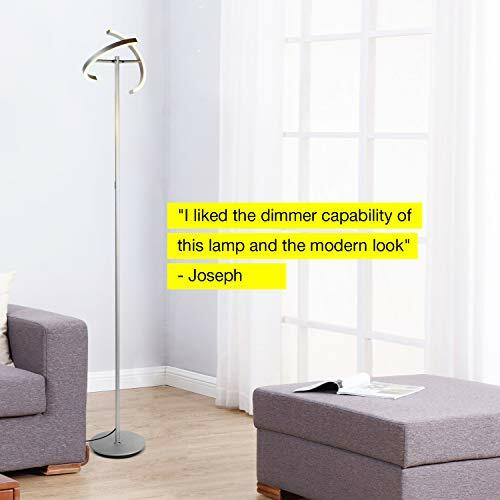 CONTEMPORARY CORNER LAMP OR BEHIND THE SOFA LIGHT: The base fits under most couches, recliners, and chairs, which means you can get light over the sectional without it taking up extra room. Because it's so slim, Brightech's Halo Split fits into tight spaces easily. The split head feature allows you to angle the light for practical or style purposes. Direct away from the eyes or face it downward over a specific area that needs more light. Cross them for a viking helmet style. BEST STURDY AND SAFE DESIGN: Brightech designed the Halo Split with your kids safety in mind. It's weighted base and sturdy design makes it wobble free and safe to have around children and pets because it will not easily tip. 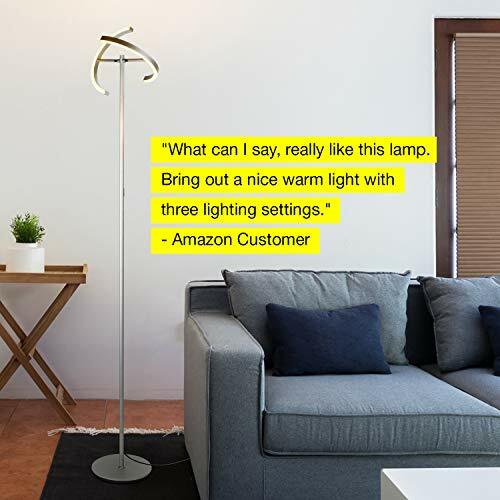 The LED lamp will never overheat and stays cool to the touch, even after hours of use. 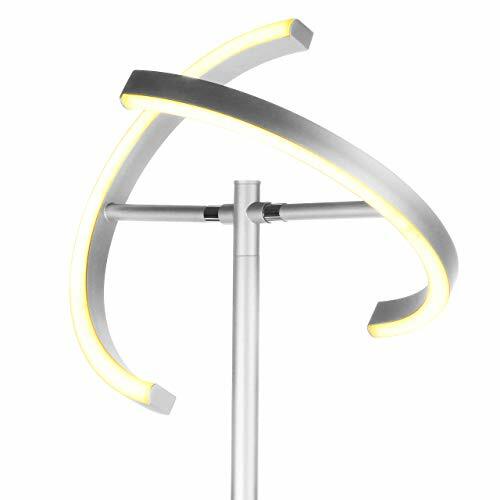 Brightech lamps are built to last and are the safest on the market! SATISFACTION GUARANTEED WARRANTY: Brightech proudly stand behind all of our products 100%, which is why we offer a full 3 year warranty. If for any reason you are not satisfied with your purchase, please contact us because our number one goal is customer satisfaction and we are committed to making it right for you. Applies to products bought from Brightech (not just Brightech branded) in new condition. 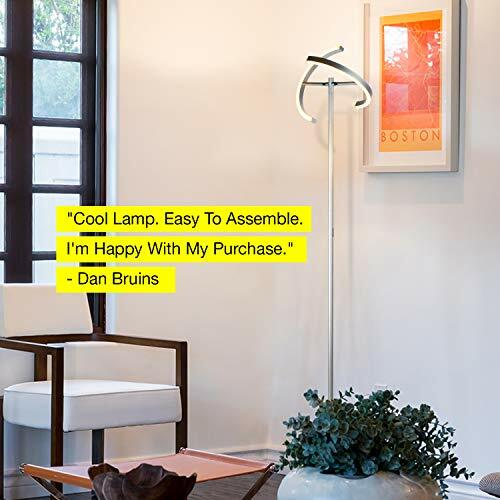 Brightech Embrace – Modern, 40 Inch Tall Lamp for Living Rooms - Adjustable to 66"